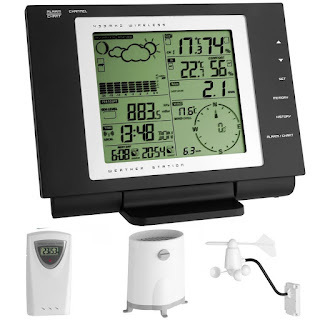 From TFA Dostmann, the Nexus weather station is a fantastic priced unit that comes complete with all the main sensors that any weather enthusiast would want to use for monitoring weather conditions. The Nexus weather station has been developed for the weather fanatic that would like to record information with the option to download this data to a computer and look back at the history. This weather station will record up to 3000 sets of data - a set of data is one piece of information from each sensor and/or function i.e wind seed, barometric pressure, humidity, etc. Recording intervals can be set as required, so you could record once an hour or once a day, giving 125 days, or 3000 days of data storage. When setting recording intervals, you should take in to consideration how frequently you can gain access to the unit to download the data. The PC software is supplied, and will allow you to export data as a CSV and then make charts, graphs etc. This is compatible with Windows 8, and any earlier Windows operating systems. The unit is capable of recording minimum and maximum temperature and humidity values reached for the last 24 hours, great for grasping a quick over view of the weather. You can also set weather alarms, for temperature and storm alerts. The Nexus has a stylish black base unit and a large, informative display, with a helpful backlight which illuminates blue - ideal if you wish to use the unit as a bedside alarm. The unit is supplied with 3 sensors - a rain gauge, a solar powered wind gauge (commonly known as an anemometer) and a temperature & humidity sensor which has a built in display. These should all be placed outside, and can transmit wirelessly back to the internal base station. Each sensor can be placed up to 100m (open field) away form the base station. We would suggest the temperature & humidity unit is either placed in a north facing position, or in a shaded area, to keep readings as accurate as possible. The rain gauge should be mounted no higher than 6 feet from the ground, and the wind gauge as high as possible - on a roof would be ideal. 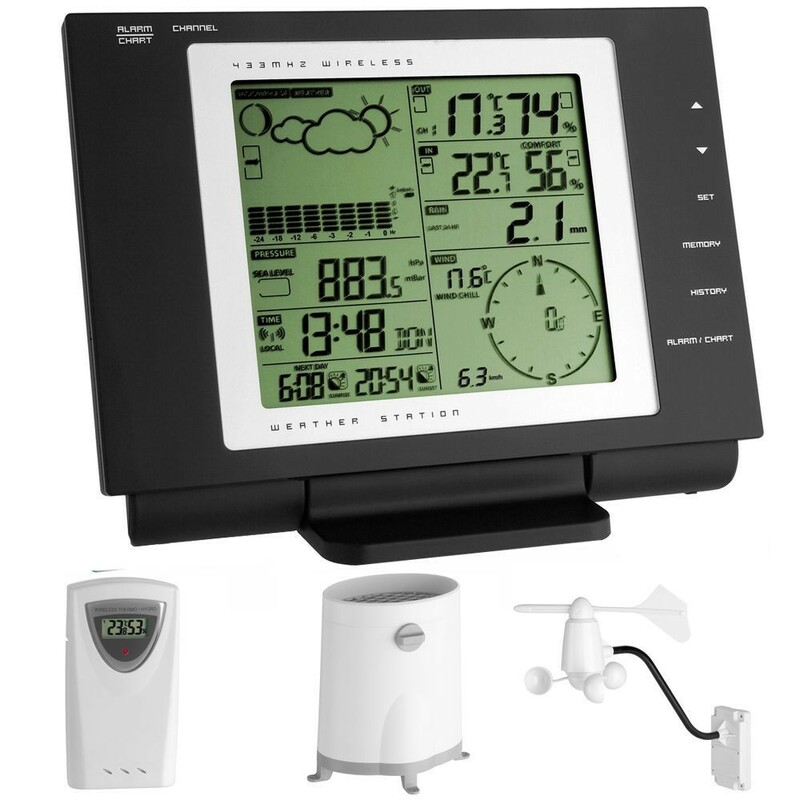 The base station simultaneously allows you to view indoor and outdoor temperature & humidity readings, rain fall measurements, dew point, wind speed, wind chill and wind direction, sunrise & sunset times, moon phases, weather forecast, current barometric pressure and the last 24 hours barometric pressure graph. The unit also has a built in radio controlled clock with alarm and snooze, aswell as a display of date and weekday, which is available in up to 6 languages. Although the weather station is already supplied with one wireless temperature & humidity sensor, it is possible to connect a further 4 for use in other locations - great if you want to measure the readings in your greenhouse, cellar, loft etc. Choose from one of 133 cities stored in the memory to display permanently the rise / set times of the sun in these cities. Manual selection of geographic position if none of the above cities are near you, using longitude, latitude and time zone.